Blueprint Gaming, the studio behind the famous Genie Jackpots slot, licensed the iconic Naked Gun movie brand to create this exciting video slot game in 2017. Memorable characters and images from the hilarious flim, that starred Lelslie Nielsen and Priscilla Presley, feature throughout the game. Naked Gun slot is also part of the Jackpot King network from Blueprint and gives you the chance to win a top jackpot. The game runs on a standard 5 reel and 20 payline setup, and has a variance rating of Medium. The Naked Gun RTP is 93.57%. There are no less than four Free Spins rounds which include Roaming Wilds and Expanding Wilds that can bring 5x mulitpliers. You can play this game on any device, including iPhone and Android mobile, tablets and desktop. It is available in free to play and real play modes, and you can try it now at one of our favourite sites, Miami Dice Casino, that offers a whopping £3,500 bonuses and 200 Free Spins to new players. Or, if you’d like to know more about the game, read on for our full review. The Naked Gun is a classic slice of slapstick comedy. There were three films in the series, the first of which came out in 1988. The video slot from Blueprint uses the office from the police station as the backdrop to the reels. The music from the film plays out with each spin, and snippets of dialogue punctuate the action. The symbols are made up of the lower value playing cards – Jack through to Ace; then the higher value icons from the film – two detectives, and then the stars of the show, Jane Spencer (Priscilla Presley) and Frank Drebin (Leslie Nielsen). The logo is the biggest paying symbol – five on a payline will bring 400 coins. There is also a Wild Symbol that substitutes for all others except the Bonus, and pays out 500 coins for five on a line, and the Scatter itself, which is the police badge. All Blueprint games have the same set up. You can stake from 20p up to £200 per spin, and set Autoplay with a Max number of plays, losses or wins limit. You can also toggle the sounds on and off as you choose. Wilds: In the base game, the Roaming Wilds feature comes into play when 3 or more Wilds land anywhere on the reels. This feature includes re-spins that continue until no more wilds appear on the reels. Home Run Free Spins – 10 Free Spins with Roaming Wilds – they land anywhere on the reels then move around with each spin. Stake Our Free Spins – 10 Free Spins with Roaming Wilds. This time, if two Wilds land on the same position you are awarded a multiplier of 2x to 5x. On the Edge Free Spins – 10 Free Spins, again with Roaming Wilds. This time, if two land on the same spot, they expand to fill the whole reel. >Crime Scene Free Spins – Again, you get 10 Free Spins with the Roaming Wilds as well. Here, not only do you get Expanding Wilds when two land on the same spot, you also get the 2x to 5x multiplier. Jackpot King Feature – As part of the Jackpot King Network, Naked Gun slot also features a Progressive Jackpot with potentially massive payouts. Land five of the Jackpot King crown symbols to enter the Jackpot King round. Then spin the reels to collect crowns and multipliers. Claim 15 crowns and you’ll enter the Wheel King round with the chance to hit the big progressive win. 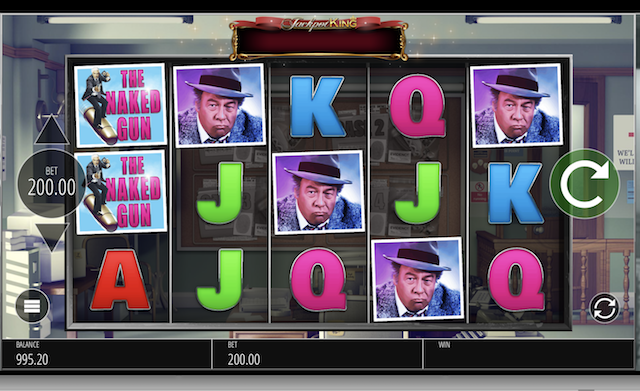 Naked Gun slot, just like the movie, is crazy but a lot of fun – the base game throws up some nice wins if you can land Roaming wilds, but the real opportunities comes with the Free Spins rounds where Expanding Wilds and Multipliers are very valuable. This game sits nicely alongside other Blueprint movie slots like the recent, Ted.